Sheppard’s Pie has created a range of dishes to suit all tastes and is updated seasonally. Would you rather spend your time cooking for everyone or sitting back and enjoying a G&T while we do all the hard work? We thought so too, so we have developed a range of absolutely delicious homemade ready meals for you to heat up and enjoy at leisure. Sheppard’s Pie is offering Verbier guests and residents a homemade ready-meal door-to-door service. We deliver to chalets in the village on Saturday and Tuesday lunchtimes, or they are available for collection at a mutually convenient time. They come in portions of 1, 2, 4 or 6, some of which can be cooked straight from frozen. Our dishes will suit all tastes and are updated seasonally. They come with full cooking instructions and most can be easily moved into oven dishes if you prefer not to use the disposable containers. You can specify on ordering whether you would like the dishes pre-frozen or delivered ready-to-cook. Please note that if delivered ready-to-cook, they may already have been frozen by us. To see our full range of mouth-watering dishes click on MENUS above, where you can place your orders in our online shop. All transactions are in CHF. Saturday for delivery on Tuesday lunchtime. Wednesday for delivery on Saturday lunchtime. If, however, you've missed the deadline but still want to place an order, please contact us to see what we have in stock - we will hopefully still be able to help! You also have the option to pick up your order from our premises in the centre of Verbier. There is a collection option in the checkout process. Cat Sheppard first came to Verbier in 1999 to work for Ski Verbier and since then has cooked for McLaren F1, Malmaison and Hotel de Vin, Tea @ Liberty, Mike Robinson’s Game and Wild Food Cookery School and spent seven years teaching cookery to London’s school children for The Children’s Food Trust. 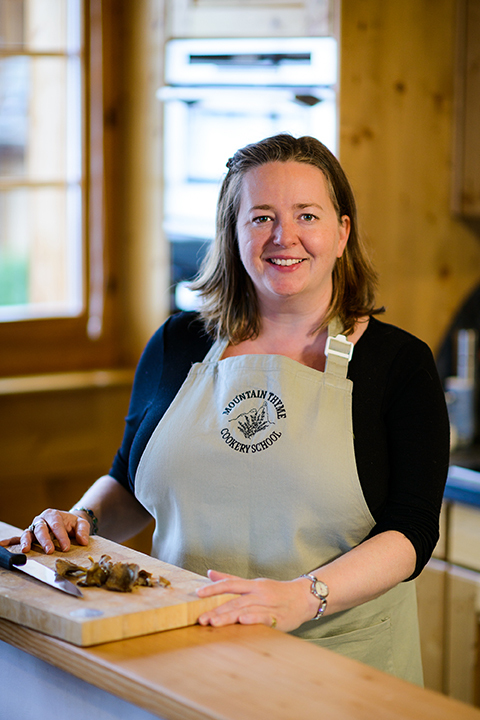 She returned to Verbier in 2016 and started Sheppard’s Pie Splendid Suppers, catering to those who want to enjoy good food in their chalets without any of the hassle. In 2017, she partnered with Amy Corbett and together they opened Mountain Thyme Cookery School. Mountain Thyme not only offers cookery classes to kids and adults in a beautiful kitchen in the centre of town, but also provides catering services, beautiful wedding and celebration cakes and private dining, either in the lovely dining room or on our sunny terrace. Cooked in our Verbier kitchen and delivered to you! We can deliver to any chalet in the village on Saturday and Tuesday mornings. We make and freeze food in portions of 2, 4 & 6 people, which can be cooked straight from frozen or defrosted in the fridge first. Fancy a cake with your apres ski drink? We can make a selection for you! Sheppard’s Pie Cakes is able to provide bespoke celebration cakes for any occasion. Cook straight from frozen or defrost in the fridge first.